Raising the Rhythms is an exuberant world music expedition. The Caribbean, America, India, Africa and Middle East all contribute influences to these richly varied and energetic compositions, whose vibrance is superbly captured in this unique recording. Smouldering layers of percussion form the foundation with a wide array of tablas, dholak, djembe, congas, bongos and bata drums. These are then joined by an exotic selection of voices and melodic instruments including Native American flute, harmonium, sax, trumpet, guitar and a plethora of keyboard sounds. James Asher’s love of rhythm and the wide diversity of ethnic music is superbly enhanced by his spirited but super clear production style. World Music fusion has rarely sounded hotter! Customer Review – “Pulsing and energizing. I heard just a few tracks from this CD while shopping in a store that was previewing it. I loved it! It brought back memories of hearing Santana for the first time. It makes you want to move. Appropriate title! A music fan from Fayetteville Arkansas 5/5“. 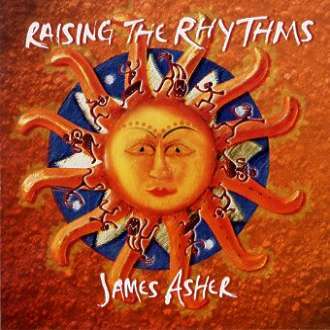 James Asher’s latest release, Raising The Rhythms, is the third installment in his global fusion triumvirate (being preceded by his best-seller Feet in the Soil and his exuberant follow-up Tigers of the Raj). Once again, James throws a variety of world music textures in his melodic and beat-driven blender, this time emphasizing the flavors of the Caribbean and the West Indies. Steel drums and accordions abound and a overall tropical vibe snakes through these mostly uptempo celebratory songs which will put a smile on the face of even the gloomiest soul who is lucky enough to hear this recording. Besides the more island-style musical numbers, there are also hints of the Middle East, Native America and other exotic locales, as well as some straight-up jazz touches here and there. Overall, while there are some slower songs on the album, the main thrust here is pelvic in nature and the tunes are aimed at getting your feet moving, your heart racing, and your soul stirring. Since James Asher is a drummer at heart, the exotic and lively rhythms predominate and the veritable world of percussion instruments is a joy to hear. Also, as usual, James shows a deft hand in his use of his arsenal of keyboards as well. There are many accompanists on the CD and all of them join James in cooking up a fiery stew of pan-global delicacies. I consider Raising The Rhythms to be the best of the Asher world fusion discs and one of the more joyous and fun-to-listen-to recordings in my collection. Written by Bill Binkelman, a.k.a. the Man who would be King. Reproduced with permission from the Wind & Wire web site. Just in time for the millennium comes this vibrant exploration of the sizzling sounds of the Caribbean, Latin America, India, Africa, and the Middle East. Unlike most fusion recordings, this music sounds authentic. Ethnic elements and exotic vocal textures weave together with smoldering layers of snappy percussion to ignite one of the year’s hottest albums. By integrating world influences in a spirit of celebration, James Asher has made an album that is more jubilant, uplifting, and pan-cultural than his earlier works like Feet in the Soil and Globalarium. He initiates one piece, for example, with a Santana-esque Latin rhythm and eventually adds melodic elements that are more universal in scope. On the next selection, he starts with a Middle Eastern groove and eventually combines it with European elements by adding a choral melody and an accordion. A boiling cocktail of sparky rhythms – this is how this album can be named (though, rather conditionally, because it does not fit any frames). Here a real unity of various cultures take place. One can observe the joint presence of Latin-American percussion, American Indian flute, vivid Indian drums and keyboards and quite European guitar, and a lot of unexpectedly coming instruments. Caribbean, Indian, European and God knows what melodies have merged together here. And all this is mixed on the full of life, fiery rhythm, which is penetrating through the album. Raising The Rhythms is an album of the united, All-Earth music, song of the Common Home, which does not know any conditions and borders, where every culture contributes it own unique aroma and they can not be separated by any covers of national separation, and there is no desire to do it! And in this Dance of Life they are together – European, American Indian, Indian and African. The are just celebrating, and they feel very good together. You are listening to this album and you are wishing to join this celebration and to be with the real friends, to dip in this endless ocean of Celebration and Bliss. Undoubtedly, the main advantage of Raising The Rhythms is that this album is full of Life up to its brims. And in this matter many remarkable musicians helped James Asher. They have played various instruments and everyone has brought something special, so the music became similar to an incredible bouquet of wonderful flowers with most delicate aromas. Generally, everything which does James Asher comes to be very interesting! He does not repeat himself and all his albums are quite different. So, Raising The Rhythms can not be compared to anything. Still, there is one characteristic feature, due to which one can recognize Asher at once: rich, very bright drums and irrepressible rhythm. And the other instruments, such as jazz saxophone, trumpet and keyboards in “Saxophagus” only emphasize tumult of this rhythm. In general, Raising The Rhythms is surely worth hearing. It is very difficult to describe this album, maybe just as incredibly difficult, almost impossible is to describe the Life itself. Written by Serge Kozlovsky. Reproduced with permission from Serge Kozlovsky’s New Age web site. Credits : Recorded and produced by James Asher at Starfield Studios – London. Mixed by Grahame Gerrard and James Asher at Starfield Studios and Capture UK. All compositions by James Asher, except ‘Grand Fiesta’ by Sandeep Raval, Kiran Thakrar and James Asher. Recorded on the Soundscape Hard Disk recording system. Mastered by Kevin Kendle at Eventide Music. Music published by James Asher/Radiant Music. New World Music 1999 [NWCD470]. Sandeep Raval: Tablas, Dholak, Djembe, Olympic Drums and Percussion. Kiran Thakrar: Keyboards. Volker Grün: Guitar (1). Johnny Kalsi: Dhol Drums. Sumeet Chopra: Harmonium. Miles Bould: Congas, Bongos, Bata Drums, Shaker, Big Ed Drum. Thomas Blug: Guitar (4,10). Nigel Shaw: Native American Flute. Dave Lewis: Saxaphone. Suzanne Bramson: Vocals. Ted Emmett: Trumpet.